Each learning program is created with a fixed set of goals and objectives. After employees undertake the training, there should ideally be measurable changes in their knowledge base and skill set for the program to be deemed successful. This means that your e-learning courses should have a mechanism to measure the knowledge it was able to transfer to your employees. This is where assessments come in. Any method of imparting knowledge, physical or digital, should be accompanied by assessment strategies. Using the right tests and quizzes you help can gauge the success or failure of your learning program. This allows you to decide if your e-learning program is getting the desired results or if you are just shooting in the dark. Using Lectora Inspire’s BranchTrack feature, you no longer need to restrict your assessments to run-of-the-mill question-answer sessions. This feature allows users to easily create and import scenario-based exercises. The scenario-based assessment modules you create can be downloaded directly to your course. In case you need to make changes, this fully integrated feature provides one-click, round-trip editing capability. BranchTrack integration allows for a learner-specific selection path during the exercise and uses a dynamic score value to control other course behaviors and remediation. This feature makes it very easy for SMEs or instructors to create questions and tests to import into Lectora. It’s also a handy way to export questions and store your test information in a textual format to be used as the key during development, or for stakeholder review. Fine-tune the way feedback is provided to your employees. This tool allows you to determine the behavior of quizzes/tests, including whether test results will be shown to employees. With the Results Designer, the way results are displayed to your employees is completely customizable. You can choose what data to show, the order in which it is presented, how text is styled, and even embed images within the results. So, whether you want to show the correct answer immediately or at the end of the course, the amount of explanation to be given after a wrong choice – everything can be customized with Lectora. Likert questions use a psychometric scale and are normally used in surveys. In a Likert Scale question, employees simply don’t choose between “Yes/No”; rather, they base their response on varying degrees of “agreeing” or “disagreeing” for each question presented. It is one of the most widely used question types in a survey, and with Lectora, you can incorporate it in your feedback sessions. Lectora has reformatted Likert table questions into a single object, thereby improving creation, editing, and sharing. Additionally, you can now specify instruction text as part of the question, and customize the range of choices as well. Lectora comes preloaded with the Stock Asset Library. This asset library includes over 2,000,000+ images, graphics, sound effects, music loops, videos, and more. You can use these elements freely in your courses and come up with innovate methods to present your assessment content. Using different combination of assets, you can add a quirky spine to your assessments and ensure they don’t become mundane at any point. 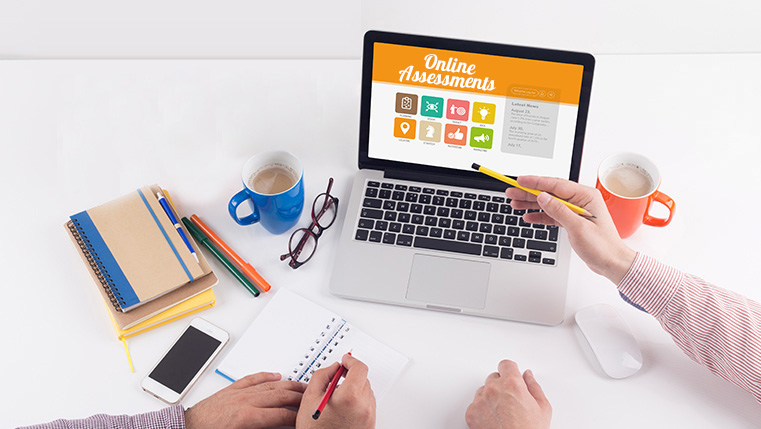 Assessment is the final nail in the construction of your e-learning program. Use this powerful authoring tool and ensure that you do it the right way.